An international summit in Aagdir (Morocco) drives home the point that fish and fishery products occupy an important place in international trade. For many countries, especially developing ones, fishery exports are essential to national economies, the Food and Agriculture Organization (FAO) experts say. According to last year’s estimate, the value of international fish trade stood at US $ 130 billion, which witnessed a sharp drop from trade worth US $ 144 billion in 2014. The decline has been attributed to lower prices for a number of important fish species and the strong gain of the US dollar against other currencies. “Fish trade is especially important to developing countries where it often contributes substantially to foreign currency earnings. Additionally, around 200 million people globally rely on fisheries—either directly or indirectly—for their livelihoods. 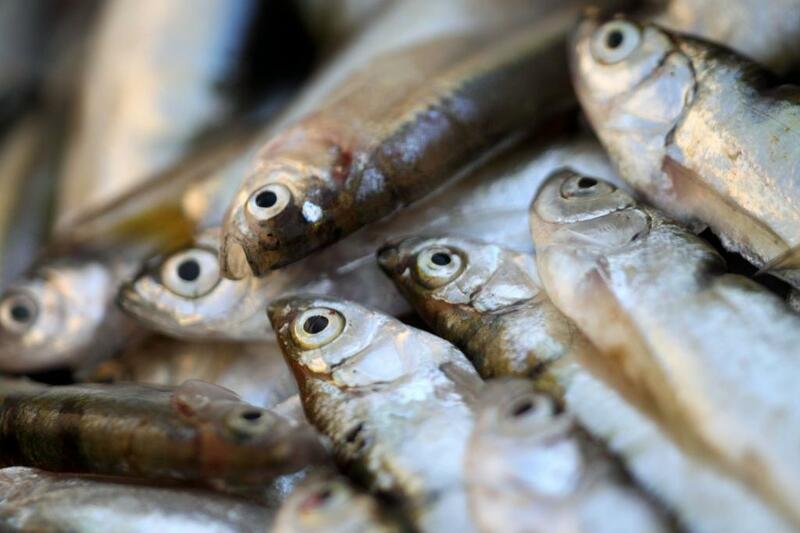 We believe that with the growing demand for fish products, there is room for expansion in the fisheries and aquaculture sector as our population grows,” Audun Lem, deputy director of FAO’s fisheries and aquaculture department, told Down To Earth. 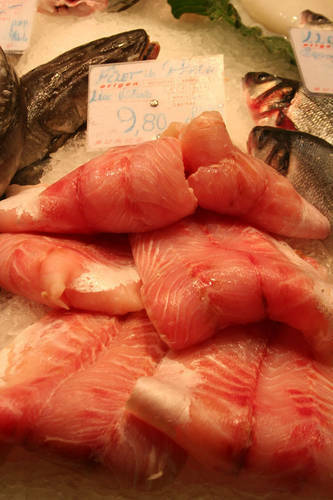 Since 2002, China has been the world’s largest exporter of fish and fishery products. In 2014, its exports reached US $ 20.8 billion. Other major exporters were Norway, Vietnam Thailand, the USA and Chile. In today’s world, the fisheries sector operates in a globalised environment where fish may be produced in one country, processed in another and consumed by people in a third country. Several important topics related to the fish trade were discussed at the 15th session of the FAO Committee on Fisheries (COFI) in Morocco. Delegates expressed concern over fish waste and losses, reducing which can meet our growing food security needs. Issues were also raised by the member countries about social and labour issues in the seafood industry. Participants also discussed the need to build resilience along the seafood-value chain in view of climate change and extreme-weather events. The good thing is that demand for fish is growing. It has tremendous potential for developing countries whose share of fishery exports currently stand at 54 per cent of the global total when measured by value and 61 per cent by quantity. “Fish has an important role to play in nutrition and food security. Fish is ‘nature’s superfood’, an important source of proteins and healthy fats… a unique source of essential nutrients, including long-chain omega-3 fatty acids, iodine, vitamin D, and calcium,” Lem said. Consumption of fish is the key to good health. It is especially crucial for women during pregnancy and lactation. The so-called 1,000-day window—from pregnancy to the child’s second birthday—promotes a child’s proper physical and mental development. The nutrients in fish promote optimal brain development, regulate the immune system and build healthy bones. Aquaculture, along with crop production and dairy and livestock farming, has an important role to play in promoting a balanced nutrition. “The aquaculture sector has changed tremendously since the Code of Conduct for Responsible Fisheries was adopted two decades ago…more than half of what we consume comes from aquaculture,” Lem added. Now, much more attention is being paid to developing aquaculture in a manner that does not impact negatively the vulnerable populations and their environment. While most fish farms are in Asia, aquaculture’s highest growth rates have recently been in Africa and south and central Americas, where its marginal contribution to food security can be higher than elsewhere due to the fact that per-capita consumption of fish in these regions has traditionally been low. However, land scarcity is also an issue when it comes to aquaculture, not only for inland aquaculture sites, but also for coastlines for maritime aquaculture. The solution is aquaculture intensification and better aquaculture zone planning and management, Lem added. “We support small-scale fisheries around the world and do not believe there is one particular region with more potential to promote this important sub-sector of the fisheries industry,” he said. While aquaponics present economic opportunities and a reliable food source in areas where aquaculture and soil-based agriculture are challenging, it also requires daily management, electricity, specialised knowledge in fish, bacteria and plant production, in addition to initial capital outlay. According to Alessandro Lovatelli, aquaculture officer in FAO’s fisheries and aquaculture department, “Aquaponics is receiving increasing attention as a viable method for providing fish protein, vegetables and profits to families and small communities." It is an integration of two food production systems: aquaculture, the practice of fish farming, and hydroponics, the cultivation of plants in water without soil. The demand for fish is growing rapidly from an average consumption of 9 kg per capita in 1961 to over 20 kg per capita today. The demand is expected to rise as the population grows. Capture fisheries cannot meet this increasing demand alone. Over the last two decades, aquaculture has seen spectacular growth, and now, for the first time ever, aquaculture makes up over 50 per cent of the fish destined for human consumption. It is true that capture fisheries generally command higher prices in the market and will enjoy a sizeable market. In the 20 years, practices have changed and efforts have been made in environmental and conservations efforts. International cooperation and strong regional fisheries management organisations are vital for sound fisheries management policies, experts say. Other actions include curbing illegal, unreported and unregulated fishing, greater traceability in fisheries products and a decline in fish and seafood loss. “Each year, 35 per cent of fish and seafood products are never consumed due to losses or waste throughout the seafood value chain, Lem added. This figure is equal to about 3 billion Atlantic salmon. Combating food loss and waste can help contribute to greater efficiency in the capture fisheries sector. Since 2013, salmon and trout became the most important commodities traded in value terms, accounting for about 17 per cent of the total value of exports. The other main groups of traded species are shrimp (16 per cent), groundfish (10 per cent) and tuna (10 per cent). With the Blue Growth Initiative gaining ground, more emphasis is being placed on the social and economic aspects of fisheries and aquaculture sectors. The FAO is trying to strengthen the role of women in both the domains. According to experts, these sectors have enormous potential to strengthen and nurture women as they have a big stake in fish processing and marketing. Women comprise 20 per cent of all primary fishing activities and 90 per cent of post-harvest work. A report, however, describes women’s role in fisheries as often “invisible”. Women are generally not considered an integral part of the workforce, often lacking the access to credit, training and technology. Capturing fish in coastal and deep-sea waters is typically a male domain and carries health and safety hazards. Women generally mend nets and are rarely paid. Women’s important role is in the post-harvest period related to processing and marketing. In West Africa, as much as 80 per cent of seafood is marketed by them. In fish processing factories surveyed in India, 60 per cent of workers were women. In Vietnam, women make up 80 per cent of the aquaculture workforce. 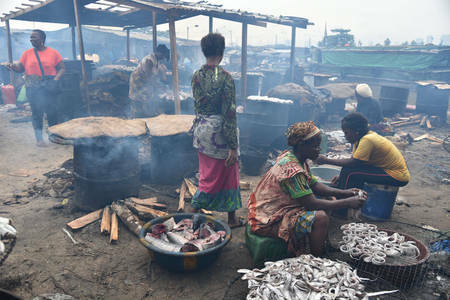 Women face discrimination in the fish processing sector. In India, they were found to be paid less than men in the seafood export industry and were away from their homes for longer periods which made it difficult for them to balance work and home. The good news is that things are beginning to brighten up. A project in Côte d’Ivoire (West Africa) introduced simple improvements in technologies to help women in their smoking activities. 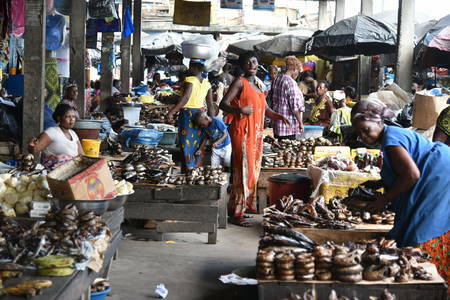 Côte d’Ivoire has a vibrant fish market, with total production estimated at around 90 000 tonnes annually. Fish consumption averages 15 kg per capita. The port in Abidjan (the country’s economic capital) is important to the economy. Fishing provides direct employment to 70,000 people and indirect employment to an additional 400,000, with 59 per cent of that figure comprising women. In areas around Abidjan, the work is divided between men, who primarily do the fishing and tend to the boats and nets and women, who sell the fish, oversee post-harvest processing, including smoking. In a bid to help women perform their smoking work efficiently, more efficient kilns were introduced that reduced harmful emissions and improved their health while at the same time improved the final product. 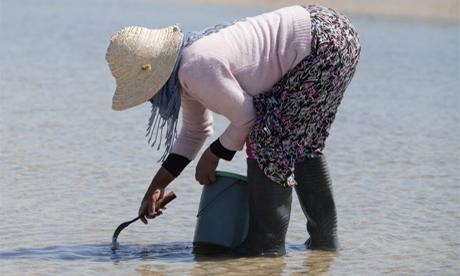 A project in Tunisia works with women’s cooperatives and help women clammers (those digging mollusks) to organise their cooperatives efficiently, to adopt improved sanitation measures and to sell directly to suppliers in the European Union. Many rural women living around the Gulf of Gabes (southern Tunisia) derive their main livelihood from beach clam (mollusks) digging. FAO fishery industry expert, Yvette Diei Ouadi, says that the international food is supporting the Tunisian government to strengthen the role of women in the clam-gathering sector in a bid to raise their incomes.